Tasmanian based 3zeroMX will team up this weekend with Beaton’s Pro Formula with a 2 day pre season motocross camp held at Santarena Park Bridport offering all Tasmanian riders the chance to build their confidence and skill set in preparation for the 2017 Tasmanian motocross season. 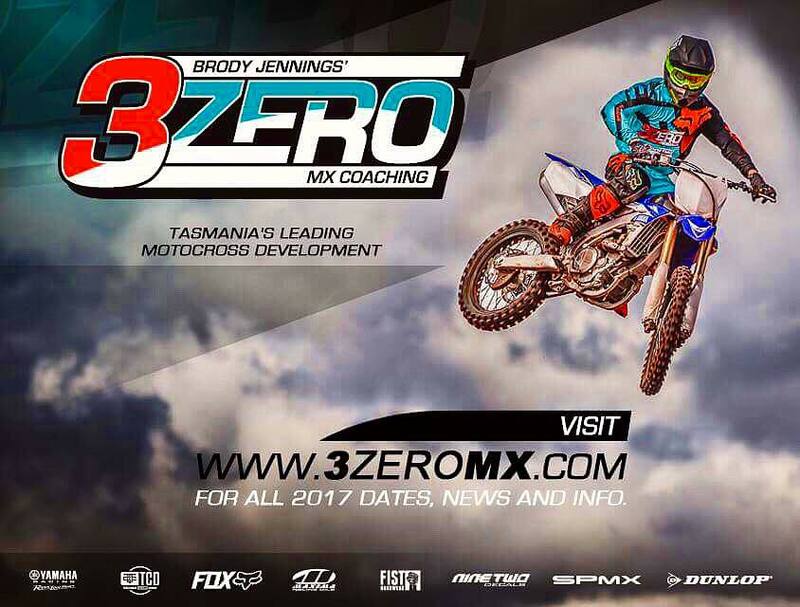 Brody Jennings 3zeroMX is Tasmanians leading motocross development school offering riders the opportunity to learn under years of knowledge and experience attained over a highly successful racing career. In collaboration with Ross Beaton also a multiple State and National champion, Ross now owns and runs Beatons Pro Formula based in Victoria. Both riders hailing from Tasmania are giving back to the next generation of future stars offering them the guidance and expertise to give them the chance to become champions. “Teaming up with Ross is always a great weekend we are very much on the same page with our coaching ideas and structure and in my opinion we now offer a very unique experience for all riders who attend our combined schools. The key is the passion we both apply to our training clinics and constant engagement bouncing new ways and ideas off each other and then transfer it all across to our students” Jennings said. This weekends school marks the beginning of a very busy year for both 3zeroMX and Beaton’s Pro Formula with more combined schools to be released in the coming months. Keep up to date with all future training days HERE. 3zero MX Coaching caters for all aspects of motorcycle riding development. Brody Jennings is a current level 2 Motorcycle Australia Coach who has over 20 years of experience and involvement with motocross and supercross racing. Learn more about 3Zero MX Coaching HERE.